2% adopted of 25,000 goal. 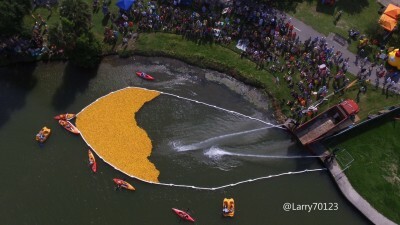 What is the Ducky Derby? It's a signature annual fundraiser benefiting Second Harvest Food Bank! Join us to watch over 25,000 yellow rubber ducks race towards the finish line in Big Lake at City Park. Family fun kicks off at 2 p.m. on Saturday, June 1st and the Duck Derby is at 4 p.m. All proceeds benefit Second Harvest Food Bank and our fight against hunger across South Louisiana. How do I enter the Duck Derby? You can Adopt a duck for only $5. You do not need to be present to win. * Are you adopting a duck on behalf of a friend, co-worker or family member affiliated with a Sales Team? If so, be sure to select the team you want to get credit for your adoption - click here to see a list of our teams. How do I get involved? Sales teams are forming now. Put together a group of friends, colleagues or family members to join the fun. Teams compete for bragging rights and great prizes. To form a Sales Team click here.For more information on starting a team or to volunteer, contact Kathryn Gsell at kgsell@secondharvest.org. Thanks to our prize donors!